Green gram curry tastes awesome with wheat chapatti and variety of breads. Moreover very healthy. 100 grams of green gram have nutrition value of energy, protein, fat, fiber, carbohydrates, calcium, iron and phosphorous which are all very essential for our kids. I am dedicating this recipe to my daughter’s babysitter who makes the most tasty curry of green gram as per my daughter’s taste buds!!! Cook fortnightly soaked green gram with 1 cup water and salt in a pressure cooker. 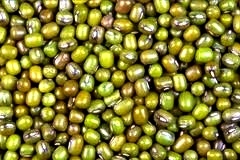 Once green gram is cooked, heat a thick bottomed wok and sauté onion in hot oil. Once onion becomes translucent add tomatoes and sauté tomatoes until they become pulpy. Then add curry leaves. To this mixture add fennel seeds, coriander powder, chilli powder and turmeric powder. Mix well and sauté for another 5 minutes. Then add cooked green grams to the gravy and mix well. If you want to make the curry more watery add little water and adjust salt. Your tasty, nutritious green gram curry is ready in less than 1/2 an hour. Serve hot to children with wheat chapatti.